Wondering if anyone can suggest a possible layout for a 60th Birthday quilt for my husband wanting to include in the life journey Dairy, Potato and Onion Growing, Sheep, Hardware Store, Fishing, Tennis, Football, Golf etc to give an overview. I have managed to collect some fabric but need help with layout suggestions. Looks like you're doing an Adult Eye Spy! Consider any of the patterns that allow for focus fabrics and just change the focus fabric each time to tell your husband's story! there's a lot of star patterns that would work well for this ... his fabric in the square centre and then coordinating points around. And of course, many others with simple squared centres, then sashing and cornerstones. Also, the hexagon eye spy design, with the star points. Or of course, you could stick with the simplistic patchwork jumble of an eye spy! Of course, the possibilities can go on and on! Some will work better with your fabrics you have ... some not so good. So many variables depending on how well your fabrics coordinate or not. I am in the midst of starting to plan a quilt for my cousin's 50th. I think I'll be going with a large center block surrounded by a border (with handprints from my darling 3-year-old second cousin -- who calls me "auntie cousin Laurie"--painted on) then another set of photos printed in the center block of a star, then maybe another handprint border then a final surround of photos in stars. The center will be largest, then the middle will be medium and the outer surround will be smaller photos. Times Three would be nice. The larger blocks could be used for each of the things he liked best and the 3 smaller blocks next to each large 1 could have coordinating fabrics that relate to the main one or have pictures of him doing that activity, or have something written in a block. I made a wallhanging for my DH's 50th that was just blocks joined by sashings. One block with the Berlin bear; a German flag; a ship (coming to Canada); a couple preprinted eagle squares; an appliquéd bike; appliquéd weights (barbells); and a Canadian flag; with the center block embroidered with Families are Forever & some wedding rings. Maybe something along that line for your DH's interests would be an idea, rather than an intricate pattern? Last edited by thimblebug6000; 02-25-2012 at 09:19 AM. 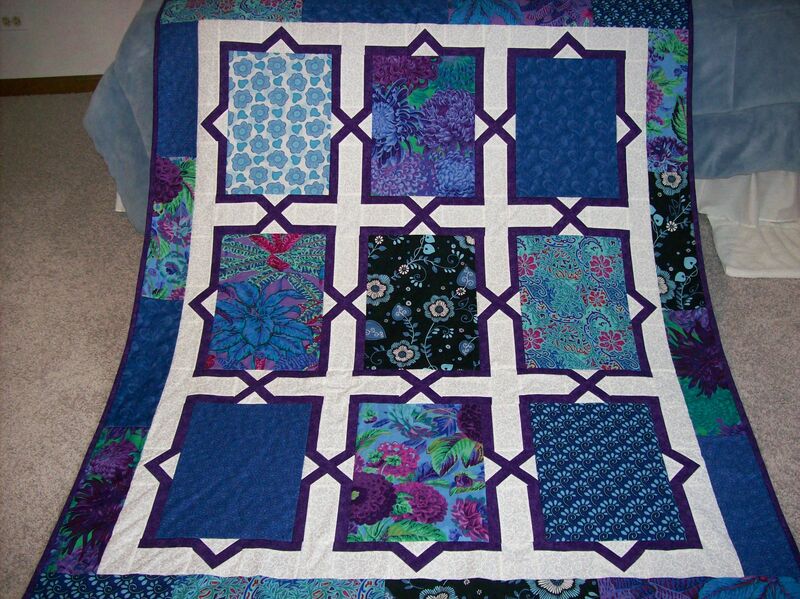 Another idea is to do something like this quilt in masculine colors. The pattern is Spanish Tiles in the book Living Large 2.